An interview with Caitlyn Corradino, the young woman behind F.I.T. 4 All. 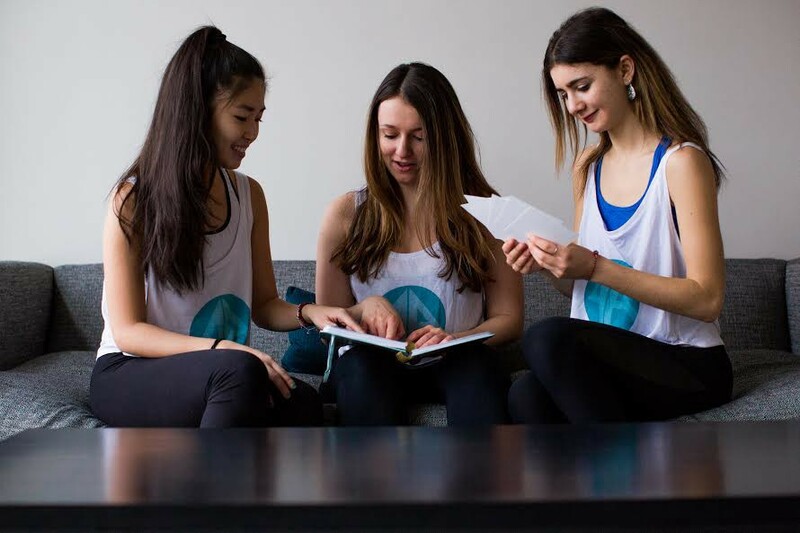 Caitlyn Corradino (center) is on a mission to make fitness affordable, accessible and sustainable with her nonprofit, F.I.T. 4 All. What started in 2015 as fellow fitness instructors coming together to teach one-off classes at nonprofits that Corradino had access to through her undergrad program, has now developed into a full-functioning non-profit that provides exercises classes for over 150 individuals per week at homeless shelters, youth centers, as well as drug and rehab centers. During these two years, Corradino realized encompassing a mission to provide accessible and affordable fitness went beyond free exercise classes, with activewear, yoga mats, water bottles and fitness accessories as necessities for participants to have their most successful workout. Thus, F.I.T 4 All’s mission became a movement — one that is open to everybody. As the company continues to grow, I sat down with the 22-year-old student, fitness instructor, nutritionist and nonprofit director to discuss F.I.T 4 All’s roots, to understand how she juggles it all, and to learn about the company’s second F.I.T. Fest coming up this weekend (June 3–4). When did you first really get into fitness? I got into fitness when I was 17-years-old. Up until then I was a competitive dancer and I really didn’t like the competitive element; I just loved moving and dancing. I was at a Relay For Life event when I was 16-years-old and they had a free Zumba class. I was like, “This is so cool, everyone is just dancing and having fun and no one is competing against one another.” That sounds so cheesy and ridiculous, but as a 16-year-old, I really was thinking that because I was so sick of competing and I just wanted to dance and have fun and do it for exercise, and that’s what Zumba was. So, I got my Zumba license as soon as I was eligible to do so and I started teaching at a gym in New Jersey, where I went to high school. From there, I went to NYU and I started knocking on the doors of all the gyms in Manhattan and asked, “Can I teach Zumba here? I know I’m not 18, but I’m awesome.” I was really, really persistent and I started working at a bunch of different gyms and from there, the gyms started sponsoring me to get more certifications, so I got Pilates, barre, yoga, you name it. Fast forward five years to today, and what is it like being 22-years-old and starting your own company, while simultaneously attending classes and working 20 classes a week to pay the bills? I see everything that I do as very related. What I do in grad school is related to what I do in the gym, is related to what I do at F.I.T. 4 All. No matter where I am, I’m focusing on wellness, nutrition, and fitness. Obviously, I don’t have a ridiculous social life or anything; I’ve definitely made some sacrifices. I have a lot of people tell me, “You’re so freakin’ young. Why are you doing this? You have so much time. Why can’t you wait?” But, why should I wait? This is all in front of me right now and I love it. It’s what gives me life and energy. There’s no reason for me to wait, it can only get bigger and bigger from here and I might as well start now. I don’t put a ridiculous amount of pressure on myself. Sometimes I struggle with balancing the time, but I think because everything is so connected I’m able to remain sane. Did you ever expect you would become an entrepreneur, let alone at this age? I guess realizing all of the things that come with being an entrepreneur — being creative, being business-savvy, being everything — I never saw myself as capable of that, I always just saw myself as being good at teaching a class and interacting with people one-on-one. But that wasn’t the case! With fitness existing as a hot commodity and almost becoming categorized into luxury wellbeing, how are you able to make exercise free? Our mission is to make exercise affordable, accessible and sustainable. In order to do that, we have to do largely, equipment-free workouts. I thought that was going to be all there was to it when I first started — as long as we did HIIT cardio, Zumba, Pilates and yoga — it’s totally accessible and affordable and that’s it. But I realized that activewear is a barrier and people need activewear in order to participate in the class to their fullest potential. So, I started collecting activewear, new and gently used, just with family and friends and ended up getting 400 clothing items. Then I had an official drive, called the Mind and Body drive in October, and collected about 800 pieces of activewear there and then I partnered with Blogilates and she donated $10,000 worth of activewear from her clothing line. So how are you getting the word out about these fitness classes? Especially for people who don’t necessarily have access to technology or social media? Honestly, I don’t know how we’re getting the word out! I started with four organizations, we have a website and we’re present at some of the largest nonprofits — Kips Bay Boys & Girls Club, University Settlement Society of New York, The Door— and a lot of people belong to multiple organizations so they will email me and say, “Oh we saw you leading a class at The Door, can you come to our place please?” It’s all word of mouth I guess. I know we talked about a lot of your classes as filled with females, are you finding that women are the majority of your participants? More females are drawn to our program because I think there’s a little bit of a stigma around men doing group fitness. I also think that there is a need for women to have this program — a need for females to recognize what healthy exercise is. I’m a feminist so I’m super passionate about talking to girls about realizing their own strength and about exercising for the right reasons and preventing them from developing unhealthy exercise behaviors. I recently decided that we’re not only going to work in low-income communities because there is a need to introduce healthy exercise to kids even from wealthier communities. Now that you reintroduce the topic of unhealthy exercising behaviors, similar to what you may have experienced in competitive dance, did you ever struggle with body image? I still struggle with body image, as do many women, but I think that I would have gone down the wrong direction of my fitness career if I didn’t realize the sharp contrast between competition dance and fitness. People sometimes go into the fitness world with this competition dance mindset — we always look perfect, we always have six packs — and I was able to intellectualize it differently. I was extra passionate about sharing that with all my classes, even before I started F.I.T. 4 All: “We’re not here to make ourselves look perfect, we’re here to make ourselves feel perfect.” There are so many things apart from having a six pack that make fitness worth it. What has been some of the best feedback you have received from either people who have come to the classes or your family? I don’t necessarily thrive off people telling me they enjoyed a class. I really thrive off people being like, “I went home and did this myself.” It kind of bothers me when people say that fitness instructors and personal trainers change lives because I really see it as inspiring people to change their own lives. So, when I am able to teach someone something, and they bring it back into their home and do it themselves, and it becomes part of their daily routine — that is the best thing to me. You have a really exciting event coming up on June 3rd, can you tell me about the concept behind this? One of the best ways to fund our organization is to hold F.I.T. Fest four times a year. The tickets are $20 and it’s basically a weekend of wellness workshops, fitness classes, inspiring speakers, snacks, networking, all that kind of good stuff that makes people happy. I get to bring the supporters and the people who keep our organization together to see and experience, firsthand, the people who we are impacting over the months and years. Also, it’s a way for us to reach people outside the communities that we serve and welcome everyone to this big event. We do our equipment free workouts, we keep our fit class really true to what it is. This F.I.T Fest is really, particularly awesome because the first day is called Fuel, Inspire, Thrive, which is obviously our vision — so we’re going to have fuel: healthy smoothies and snacks, inspire: a panel of four people who have personally helped me redefine fitness and wellness as something more sustainable and accessible and recognizing fitness as a way to thrive in your everyday activities. Can you highlight a couple of the panelists? Another person is Corinne Wainer. She started Shaktibarre, a studio in Williamsburg, Brooklyn, that has sliding-scale prices so that everyone can basically afford to take Pilates, yoga, barre classes. She also is all about sustainable, accessible, overall wellness; her studio is so simple and what fitness should be. Every class she teaches she will be like, “We’re going to stop for a second. Can three people say why they came here today?” She never lets you forget why you’re working out and she has changed my life tremendously since I started working there. After this event, what’s next for F.I.T. 4 All? I am going to launch the functional, integrative training program. I have five personal trainers that have signed on to do it and basically, 50 percent of the proceeds from those personal training sessions are going to go directly to F.I.T 4 All. It will be like a “get-give” fitness model, so you get a workout, you give a workout. We’re hoping to expand some more partner communities and we’re going to partner with the National Eating Disorder Association, NEDA, who created the Body Project and Project HEAL, so with that partnership we’re going to be able to create more wellness workshops, so we’re not just necessarily nutrition and fitness but also talking about body image, body positivity. New York-based freelance journalist combining stories in travel and wellness, culture and human interest.